Infrastructure Idea Hunt is a campaign which aims to provide encouragement and opportunities to those who are willing to share their innovative ideas related to infrastructural development in order to solve the socio-economic hurdles currently faced by the Nation. Idea Hunt is an initiation taken by Idea Studio Nepal along with Confederation of Nepalese Industries with an objective of increasing general public engagement to identify problems and come up with possible innovative solutions to address infrastructure deficits. •	Calls for Infrastructural development Ideas from various background: Transportation, Irrigation, Energy, Housing, IT etc. via different media vehicles. •	Screens it on the basis of its need for the Country’s development, innovation, creativity, feasibility and sustainability. •	Selects top 10 Idea and nurture them to make investment ready through 3 days’ incubation workshop at Kathmandu University School of Management.
. •	Prospective to get AWARDED with cash prize. •	Prospective to participate in Idea Studio Nepal; a National level incubation Program. CNI is body is an organization that works in coordination with other organizations and is increasingly becoming involved in areas where the existing system has failed to deliver. It has been raising issues like the persistent economic situation imbroglio, need for reforms in financial sector, strengthening of private sector's capabilities, the streamlining of private sector's initiation on development agenda, double digit growth issues and industrialization based on trade competitiveness. CNI is working along the lines of several organizations in various developing countries such as India, Japan, Thailand, Malaysia, etc. and hopes to hire expertise as well as bilateral support in development of the Confederation, the theme of which is, “Talking Business, Talking Change” . 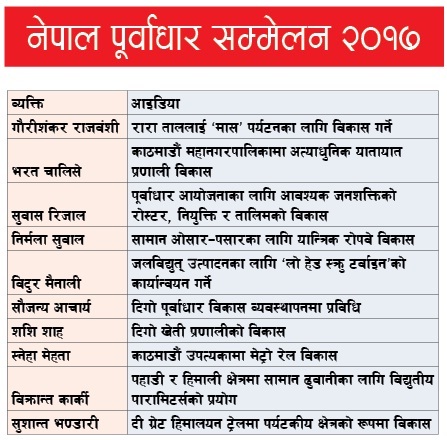 In 2017, the idea has come about to include Infrastructure Idea Hunt in partnership with Idea Studio Nepal. 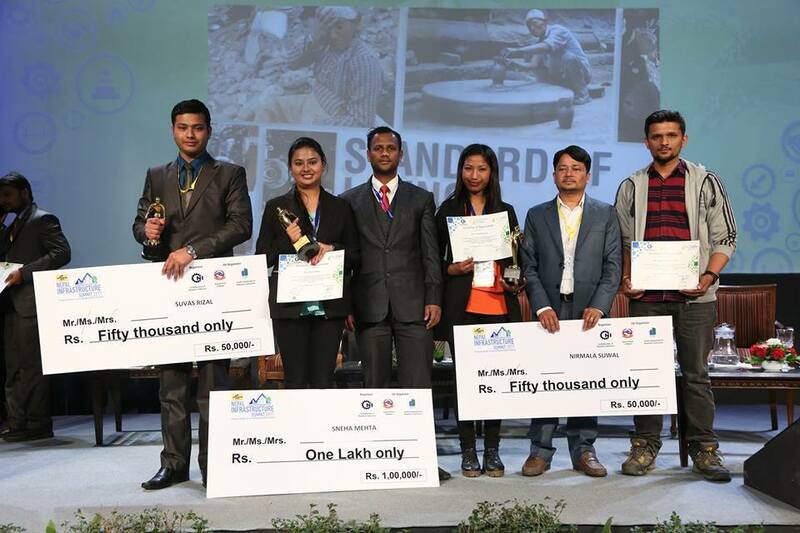 Congratulations to our Top 3 Ideators of Nepal Infrastructure Idea Hunt at Nepal Infrastructure Summit . First Prize- Sneha Mehta for her idea of Monorail in Kathmandu, Second Prize- Nirmala Suwal for Mechanized ropeway for transportation of goods. Third Prize- Suvas Rijal for Managing Roster, hire and train infrastructure labour.